In his book, Maurice River Memories, Joseph Reeves, Jr., recorded the memories of a youngster growing up along the Maurice River. This description of one fishing trip in 1943 gives a boat-side tour of the middle reaches of the river where one of the pristine tributaries, the Manumuskin River flows into the Maurice River. What's interesting about this description is that the reach Reeves describes as Steep Run is south of Port Creek Reach, where the Manumuskin River enters into the Maurice River. 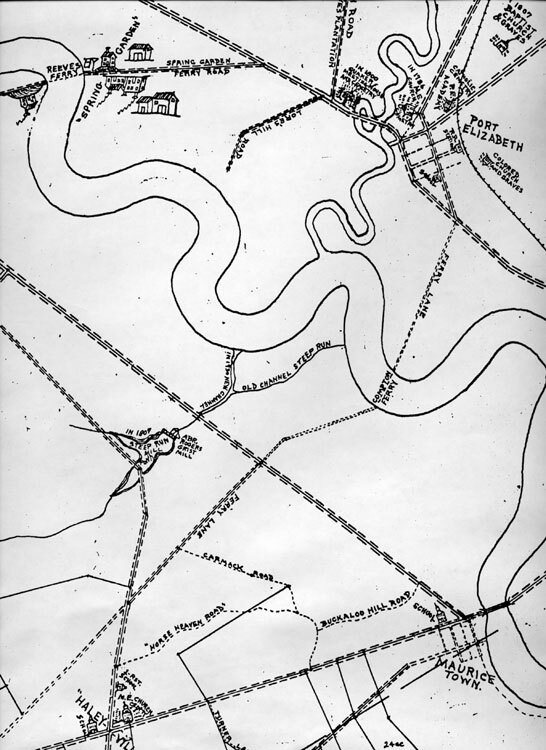 In the Lummis Library in Greenwich, NJ, there is an original 1862 map based on surveys of S.N. and F.W. Beers. 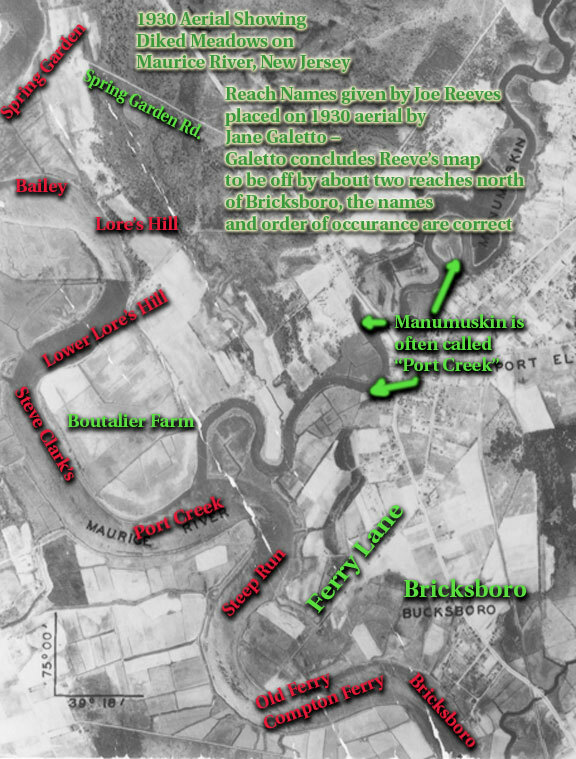 This map shows an unlabeled creek that empties into the Maurice River from the western shores just north of the Compton Ferry site (Old Ferry) but south of the mouth of the Manumuskin (Port Creek). The path of this creek correlates with other maps showing Steep Run. On a compilation map created by local map collector Charles Hartman in 1950, this same waterway empties almost opposite the mouth of Manumuskin, apparently after the stream's rechanneling. "A keen observer would have detected the changes in the river by now. It was slightly narrower than further downstream, the reaches were shorter and the treeline beyond the marshes came closer." "Swinging the long, gradual bend around Old Ferry, we tried not to tow the drift net more than necessary," Reeves wrote. "We caught another shad roe in the upper part of Steep Run Reach and Dad swapped places with me for the pull around the bend into Port Creek Reach, where the river nearly doubles back on itself." "The pull around the bend into Port Creek is strong,” Reeves wrote, because the river "nearly doubles back on itself." Reeves explained that his dad needed to "row hard" to get through the strong current there at the Port Creek Reach, and was able to relax as they "drifted past the mouth of the Manumuskin." Reeves' narrative, and the map on the end page of the book, confirms that even a decade after the rechanneling of Steep Run, old-timers continued to refer to Steep Run Reach at its original course, south of Port Creek. But eventually that memory faded with the tide and the name Steep Run logically became associated with the location of the modern course of the stream.